was a child prodigy who had already acquired a broad understanding of Dharma philosophy and meditation by the age of ten. His teacher, Pomdrakpa, had received the full Kagyu transmission from Drogon Rechen, the first Karmapa's spiritual heir. 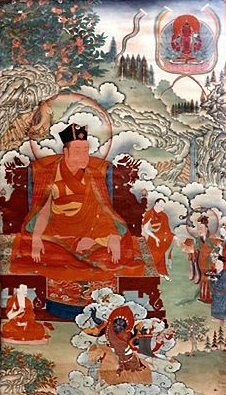 Pomdrakpa realized, through certain very clear visions, that the child in his charge was the reincarnation of Dusum Khyenpa, as indicated in the letter given to Drogon Rechen. Each attempt to capture, or even kill, the Karmapa was thwarted by the latter's miracles. At one point the Karmapa 'froze' a battalion of 37,000 soldiers on the spot, by using the power of mudra, yet all the time showing compassion. He eventually let himself be captured and put in exile, knowing that his miracles and compassion would eventually lead to Kublai Khan having a change of heart--which did in fact happen. Returning to Tibet towards the end of his life, he had an enormous (sixteen-meter) statue of the Buddha built at Tsurphu, to fulfill a dream he had had long before. The finished work was slightly tilted and Karma Pakshi straightened it by sitting first in the same tilted posture as the statue and then righting himself. The statue moved as he moved. Before dying, he told his main disciple, Urgyenpa, details concerning the next Karmapa's birth.